I still can't stop thinking about it. 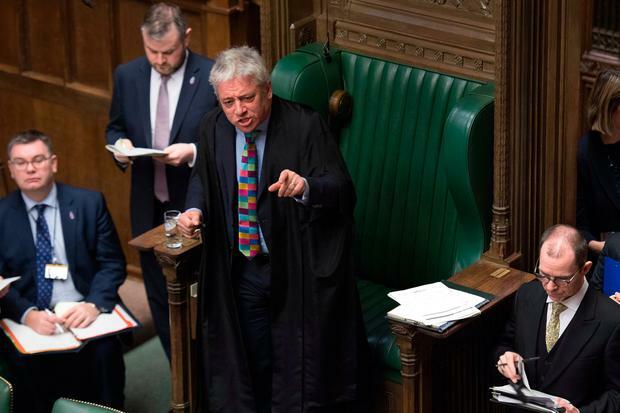 That extraordinary moment on Monday, when Conservative MP James Cleverly protested to John Bercow about his decision to block a third vote on Theresa May's Brexit deal. The speaker, complained Mr Cleverly, should have made this announcement before the second vote was held. Because, he whimpered, if MPs had known that it was the last time the deal would come before them, they might have voted for it. Poor MPs. You've got to feel for them. After all, how were they supposed to know that the meaningful vote would be meaningful? Theresa May held a meeting of her cabinet to discuss asking the EU to delay Brexit. Yet, according to one attendee, she didn't actually specify how long a delay she would request, or what reason she would give for requesting it. Perhaps she doesn't know. "Dear Brussels, please may I have a nine-month extension to decide how long an extension I want and why I want it?" In Brussels, Michel Barnier - the EU's chief negotiator - held a brief press conference. He exuded an air of quiet long-suffering, like a father preparing for the umpteenth time, and with little hope of success, to tell his feckless teenage son to make a start on the homework that was meant to have been handed in a week ago. If Mrs May wanted an extension, he explained patiently, she had to say what it would be for. It had to have a concrete purpose. "An extension needs to be linked to something new," he sighed. "There needs to be a new event..."
Ultimately, it will be the leaders of the 27 EU states, not Monsieur Barnier, who will decide whether or not to grant Mrs May an extension. But if they're as weary of the whole business as he seems to be, her prospects don't look good. "Everyone should now finalise all preparations for a no-deal scenario," said Mr Barnier - before pointedly adding: "On the EU side, we are prepared." Imagine if they turn her down. The Brexit process began with the UK deciding to leave. It could end with Brussels refusing to let it stay.